Everyone loves crayfish, or crawfish as most people I know call them. The delicious little swamp bug tantalizes the taste buds of millions of Americans every year. What most connoisseurs don’t know, however, is that the creatures we’re putting in our mouths are closely related to the pests we squash at fist sight. 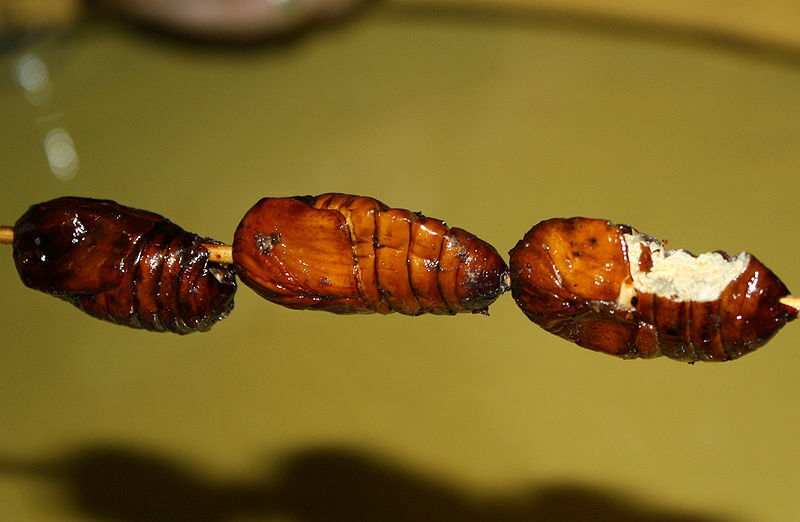 Fried silkworm (probably tussah oak silkworm) larvae sold by a street vendor in Jinan, China. Author: Steven G. Johnson. Source: Wikimedia Commons. Recent genetic research has shown that insects actually evolved from crustaceans around 400 million years ago. That may sound like a long time, but the connection is still close enough that insects like cockroaches and dust mites can trigger allergic reactions in people with shellfish allergies. So if you’re allergic to shrimp, you’re also allergic to roaches because they’re so closely related. Are you thinking twice now about going to the boil this weekend? Well, here are a couple of reasons why you shouldn’t be. First, you already consume insects every day. Our government allows the foods we consume to contain a certain amount of bug parts. In its Defect Level’s Handbook, the FDA allows up to 2,500 aphids per 10 grams of hops and 225 insect fragments per 225 grams of macaroni or noodle products. So every time you eat spaghetti or have a beer, you’re inadvertently consuming government-sanctioned bug parts. But that’s not a bad thing. Insects are actually high in protein and vitamin content. 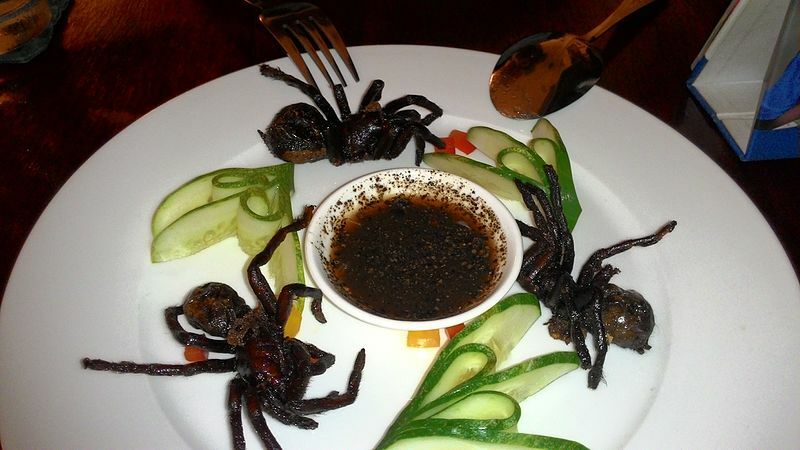 Fried Tarantula in Cambodian Restaurant. Author: Jaiprakashsingh. That leads us to my next point. By eating bugs you’re actually ahead of the nutrition game. Many scientist believe that in the future we will have to rely on bugs as a source of food. Think about it. How many cows does the average person consume each year? Each cow requires at least 1.5 to 2 acres of grazing land and additional food resources to grow. Cows require about 8 kg of feed to produce 1 kg of meat. Also, it takes about 2 to 3 years to bring beef “from farm to fork”. Bugs, on the other hand, require practically no space and require only 2 kg of feed to produce 1 kg of meat. They also reproduce incredibly fast. The world’s population is growing exponentially, it’s predicted to reach 9 billion by 2050. We’re going to need a lot of food to support that population and consuming cows and other traditionally farmed animals as our main source of meat just ain’t gonna cut it. Now that doesn’t mean that we have to stop eating cows all together. A lot of people seem to be afraid of that. But nobody is proposing that we only eat bugs and vegetables in the future. The idea is simply to eat less environmentally unfriendly foods like beef. And if you think that’s bad, then clearly you’re not a fan of crawfish. Boiled crayfish with dill. Author: Knuckles. Every year Louisiana alone produces 100 million pounds of crawfish, every ounce of which is enthusiastically slurped by people who don’t even know that they’re helping the environment just a little. It should be noted that fish farms in general, including crawfish farms, still have a ways to go before they achieve environmental stability, however with improved aquaculture methods the future looks bright. Insects, on the other hand, can be farmed now with practically no impact on the environment. So maybe it’s time to move past the gateway bug (i.e. 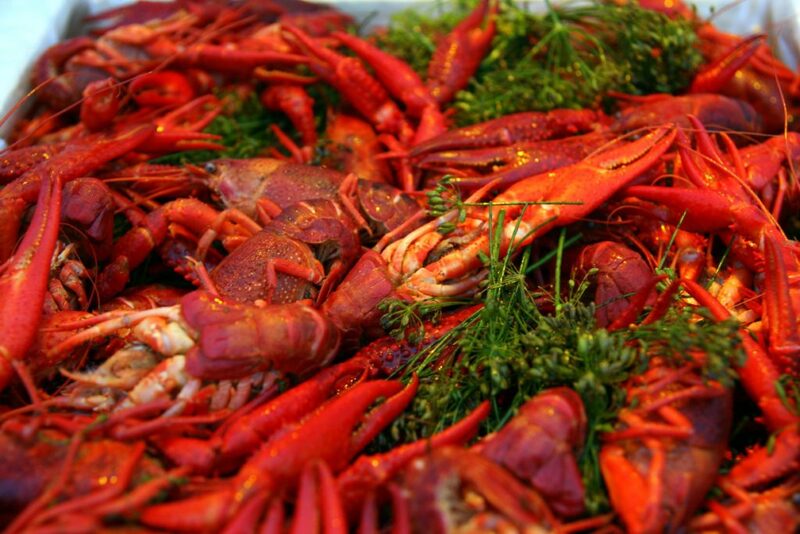 crawfish) and try something equally delicious and even less harmful to the environment. Crawfish are a perfect example of why entomophagy, or eating insects, is not something to be afraid of. I’m personally looking forward to expanding my bug-food horizons. Right now I have my sights set on tarantulas, which are a little further removed from crustaceans than insects are, but I hear they taste like soft shell crab. Eating crawfish is a unique culinary experience, there’s something about it that encourages people to socialize. Maybe it’s the difficulty involved in getting the meat out. You have to entertain yourself somehow while you’re ripping the thing apart, why not have a good conversation with friends? I’ve never attempted to eat a plate of crawfish without company, and I don’t have any desire to, because without social distraction I’m sure the labor involved in getting each bite would be positively frustrating. But that’s the point, eating crawfish is more of an event than a meal. Maybe in the future we all will add more bug related events to our schedule. Spider Saturday, anyone? After all, it doesn’t really matter what it is you’re eating, whether it be crawfish or cockroaches, all you need to have a good time is good friends and a lot of Tony Chachere’s. And where you’re finished with your bug feast, be sure to bring the crowd over to the Houston Museum of Natural Science, where you can check out the close relatives of the crawfish you just ate in our Cockerll Butterfly Center!